But the garden fared much better, butterflies, birds were at their best. Flowers thanked the heavens for the sun they know will disappear soon for 2-3 months. And best of all my garden was on fire again- the Fire Ball bloomed. 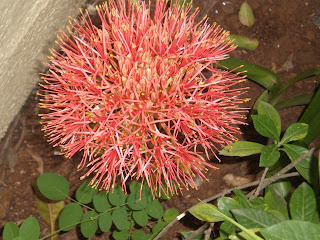 Also called Powder puff, blood lily, and football lily (Botanical name Scadoxus (Haemanthus) multiflorus Family Amaryllidaceae) this is a truly unique flower. Each head is a spherical umbel which can be made up of upto 100 flowers (I never tried to count!). Fire ball lily was a lovely sight. This year my 4 year old son was interested to touch it to feel the delicate blooms of the ball. The weight of the bloom is sometimes too much for the stalk to bear, I have to stake it sometimes.. This year, I am making a promise to myself, I will not be lazy and allow the bulbs to languish in the soil after they are done with the show. I plan to split and store the bulbs out of the ground for the next year. 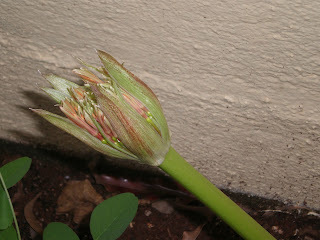 Culivation of fire ball lily is done by their bulbs. After the show is over which typically takes a week, the leafy growth starts. The plant grows almost two feet in height and then dries off. The leaves have done their job ie prepare enough food which is sent back and stored in the bulbs for the next year's performance. Will I lose my fire ball lily? This fear is behind my laziness each year. I don't wish to rock a steady boat, but after more than five years of only one bloom per year I expect that there should be more bulbs for me to experiment with. The ground holds its secrets- time will tell, are there more bulbs down there or not?